Designed for use with Artograph digital art projectors, this handy tripod features a lightweight ball head that rotates 360° (with an 180° vertical adjustment) for easy projection onto walls, easels, tabletops, ceilings — virtually any surface. Three multi-position legs feature with locking, thumb-release levers, and a built-in bubble level positioned near the leg hinges assures a perfect vertical setup. 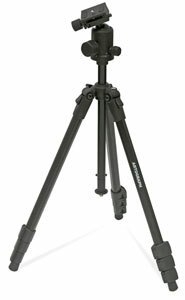 The tripod features a maximum working height of 59" and a minimum working height of 17". Weighing just 3.3 lb, it holds a maximum load of 8.8 lb. It includes a cotton canvas carrying bag with a positioning strap and a double-slide zipper for easy access. ® Artograph is a registered trademark.